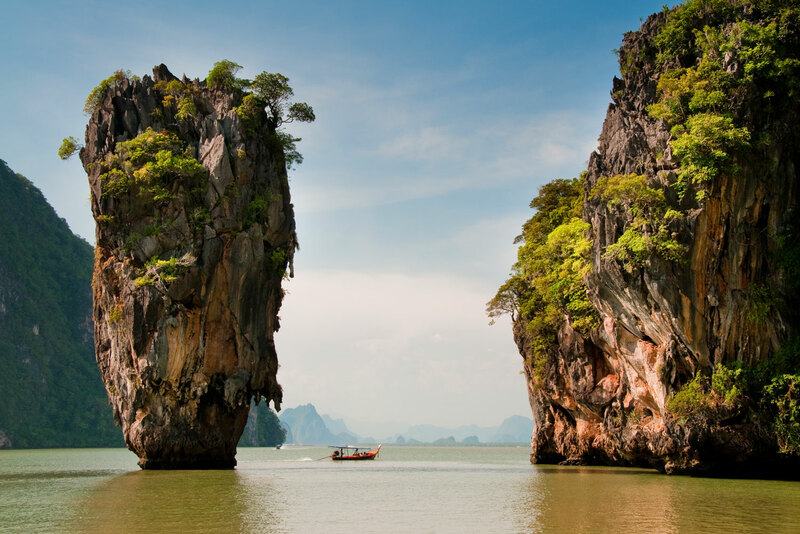 Speedboat tour around Phang Nga Bay, Phuket, Thailand. The cruise to James Bond Island is one of those excursions that sounds so touristy I would usually avoid it like the plague. But I grew up loving Bond movies and the island scenes in The Man With The Golden Gun were just so other wordly, gobsmackingly gorgeous that in my childhood brain, I desperately wanted to see if they really existed. So, when I got to Phuket, not doing the James Bond Island day tour was not an option. My adult expectations were fairly low whilst my inner child dared to hope. I am happy to report, my inner child won out. I was blown away by the sheer scale, number, and beauty of the islands from the moment we left Ao Po on the eastern coast of Phuket. By the end of the eight-hour tour, I was seduced by nature and emotionally exhausted. I felt as though I had dipped into Mother Nature’s soul. The speedboat was the first nice surprise. It was a sleek, brand new vessel, and comfortably fitted the 21 of us on board with plenty of room. A hazy mist made departing Ao Po an almost mystical experience as majestic shrubbery-shrouded monoliths waded in and out of the gloom. Scattered in amongst these prelapsarian karsts were lush uninhabited islands fringed by golden beaches. Had anyone even set foot on those sublime beaches? We reached James Bond Island (Koh Khao Phing Kan – ‘koh’ translates to island) late morning. My inner child was a little disappointed. The tiny but deadly Nik Nak failed to emerge with a bottle of Dom. Instead of Scaramanga’s lair, the island had been overrun by souvenir stands selling overpriced tat to hordes of tourists. My inner adult was singing cynically, ‘I told you so’, to my glum inner child. But adult me spoke too soon. We climbed to the other side to see the famous Nail Island (Koh Tapu) just beyond its shores, where Scaramanga’s destructive solar weapon was concealed. It was a gravity defying site, sprouting vertically from the shallow water like a carrot being plucked from the soil. The afternoon was simply amazing. The skipper, Australian Mark Pendelbury, organised locals in inflatable canoes to guide us through the incredible caves on Koh Hong (Room Island). The island is in fact a crater with an inlet that allowed us to pass into a central milky green lagoon where we jumped into canoes for some cave exploration. Inside the caves and around the lagoon water erosion had sculpted – and is still sculpting – the limestone and shell-encrusted rock. With a little imagination a myriad of shapes resembling creatures emerged: a life-size reclining elephant, a giant open crocodile snout, even an enormous fish. We were collectively mesmerised and fell into an awed silence. To shake off the spell of nature we dived overboard for a swim. The sheer variety of activities on the tour was awesome. On Koh Phanak we walked through a huge cave with stalagmite and stalactite formations before stumbling under a forest of towering mangrove roots. We snorkeled at Koh Hong Krabi – a talcum white bay lapped by transparent water. We passed the humble cave dwellings of sea gypsies with makeshift fishing nets and wooden boats beside them, and ancient paintings on cliff faces (approximately 1,500 years old). On foot we confronted a towering Bodhi tree, some 65 metres high in a dense rainforest koh. We also visited a remote community at Koh Panyee, a Muslim “floating” fishing village where residential huts, shops and restaurants are built on stilts over the surrounding shallow sea. Sitting in the middle of the ocean we feasted on delicious plates of curried crab, coconut-crumbed prawns and Massaman curry. Leaving the boat at Ao Po around 4pm, my inner child was delighted and the cynicism of modern life on the wane. Life was good, nature was beautiful, the world was a happy place and everything was as it should be. (The fee includes free pick-up and return to hotels and resorts in major Phuket tourist areas, snacks, non-alcoholic drinks and an all-you-can-eat lunch). I would not recommend the tour for kids under seven.